Companies are always looking for unique way to market their latest products to attract new customers and build brand awareness. Simple print advertising and TV adverts are being replaced by extravagant P.R. stunts. Guerrilla marketing campaigns involves high energy and imagination, focusing on grasping the attention of the public in more personal and memorable levels. 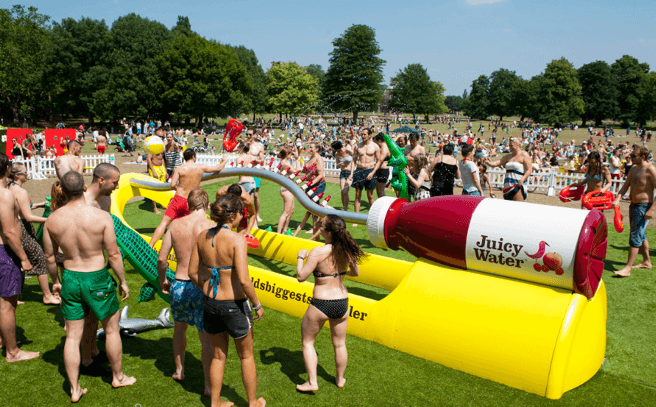 Innocent Drinks approached us with a very ambitious Bespoke Water Special Effect brief which involved breaking a Guinness World Record. 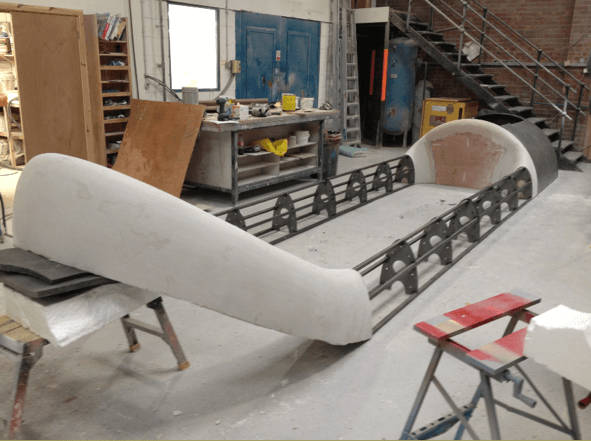 We were set the task of creating the World’s Largest Sprinkler – a full working replica of your standard garden lawn sprinkler, and it had to be over 8m in length in order to qualify. Innocent then wanted to place the sprinkler in a London Park on a sunny weekend and let people cool off from the heat in the water. 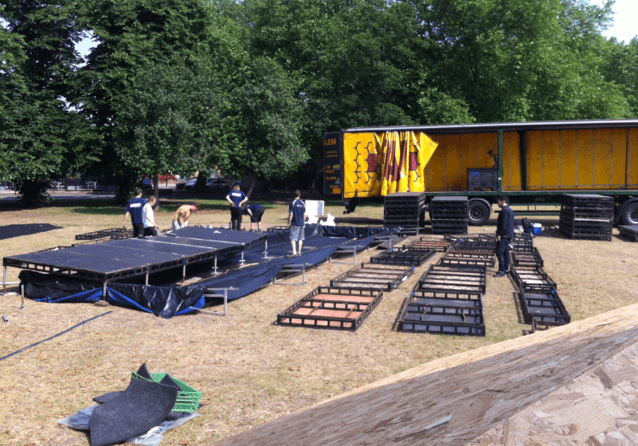 As the project progressed, our role developed to cover full event management across the entire weekend. Transporting such a large item. How to recycle the water, so that the sprinkler didn’t sit in a muddy puddle. Crowd Management / Health & Safety. Managing the timeline as there was not a specific event date (it needed to be 25 degrees or more). The fist thing we did was to employ a specialist to help with the construction of the sprinkler itself. We recruited a fantastic business called ‘Specialist Models’. We worked alongside them during design, production and testing – Entertainment Effects supplied the water elements and they constructed the outer shell. The sprinkler was constructed out of 7 different pieces to enable us to transport it, it was then put together on site. The product looked seamless though and you had to look very closely to see the joins. To manage the water, our team built a huge water tank and covered it in steel deck stage. The stage had a slight slope, allowing the water to flow down back into the tank. We then covered the deck with AstroTurf so that it blended into the parks surroundings. We liaised with the council, detailing all of our plans for the event and submitted a event specific Risk Assessment (all parties agreed that some fencing was required to manage crowd control). We also brought in a security team to manage the flow of people and a DJ to give the event a real party feel. One of the biggest obstacles was not knowing when the event would take place. We agreed with Innocent that we’d monitor the weather forecast and take a call on any given Monday when the forecast was very hot for the forthcoming weekend. We had agreements in place with many suppliers and set all the wheels in motion when we were given the green light. The forecasters were right (for once) and London was bathed in sunshine with the mercury hitting 30+ degrees. The event was seamless, everything went perfectly to plan – the only thing our team misjudged was estimating the popularity of the sprinkler. The crowds flocked to use it and we developed a queue very quickly and it stretched for over 100m for the entire weekend. We constantly had to reduce the amount of time each group had on the sprinkler at anyone time, before rotating to the next group in the queue. The Guinness Book of Records staff came down, measured and authenticated the model. Innocent sampled thousands of drinks to locals in Victoria Park and to top off a perfect weekend, Andy Murray won Wimbledon.